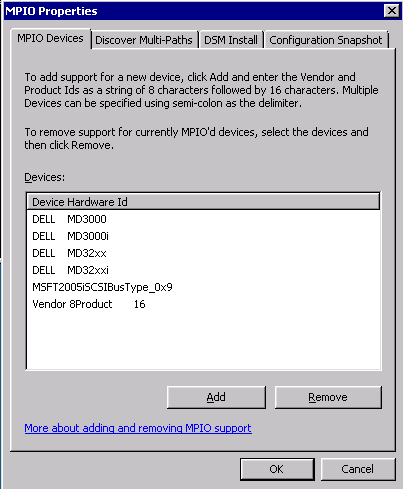 We just finished setting up our Hyper-V failover cluster with a Dell MD3220i, and in the process I had a hard time finding information about the specific MPIO driver to use from Dell. Its actually very simple. On the server you installed it on, look in C:\Program Files (x86)\DSMDrivers. Copy the md3dsm folder to your Hyper-V host. 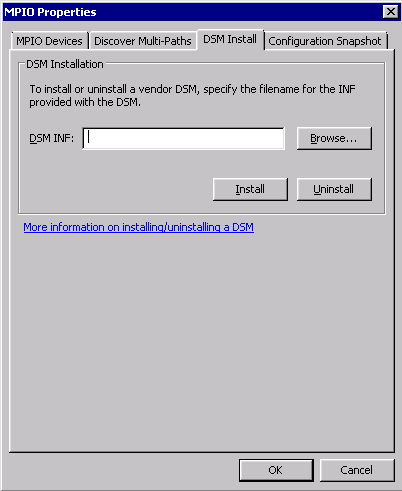 Click on the “DSM Install” tab, and then browse to the md3dsm folder. Use the md3dsm.inf file, and then click “install”. I am about to go through the exact same process with 2 PE R610 servers and a fresh new MD3220i SAN on the way. Can you tell me more information about your config and anything else I should watch for? Thanks! Hi cphastings; thanks for the comment. I’ve been planning to do a good write-up, so this is as good of incentive as any. I’ll try and get it out today or tomorrow. Thanks again Jeff, I look forward to it. I neglected to mention the Dell PowerConnect 6248 switch I’ll be using as well. Not sure what switches you use, but if there are any tips there also that would be great! The post is up now; we are direct connecting our two hosts to the MD3220i, since adding a switch (or two) with two hosts has no advantages. We considered the 62xx series, and will deploy two as soon as we add a 3rd Hyper-V host. The only other configuration I think you’d need would be to enable Jumbo Frames on your switchports, so that its MTU 9000 all the way through the storage network. Where did you get the driver for Hyper-V 2008 R2 please? From Microsoft? The one included when installing MDSM for w2k8 R2? I used the driver from the folder mentioned in steps 1 and 2 of this post. I suspect the driver could be found from the MDSM CD as well, but I haven’t gone looking for it.